For others named Ralph, see Ralph (disambiguation). 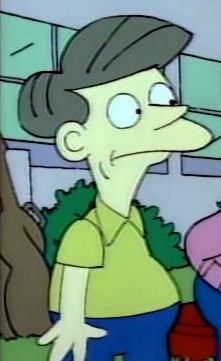 Ralph' is a student at Springfield Elementary School. He is seen waiting on the front steps of the school with his friend, Stan. When Lisa approaches them he compliments her on her smile, and says that he used to think of her as sort of a Braniac, but now she is OK. There is an instrument case behind him, but it is unclear if it belongs to him or Ralph. Modified on March 2, 2018, at 15:43.